One of the most common complaints that dog owners have is the problems their dogs cause when left alone. Unwanted behaviors include barking, destructiveness, house soiling or escaping from the property. Home alone behaviors can be problems not only for owners but for neighbors as well. Causes of these problems include “boredom” fears and phobias, separation anxiety and more. Dogs’ home alone behaviors are NOT motivated by spite, revenge, rebelliousness, or just “acting out.” Many dogs are labeled as having “separation anxiety” when in fact they do not. 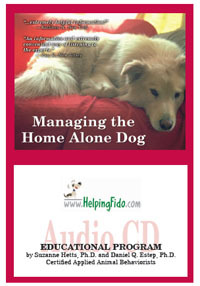 This 2 CD set is the edited recording of our telecourse on home alone problems. In this audio program we discuss how to identify, prevent, manage and resolve the various types of home alone problems. Included is a discussion of various behavior modification and management techniques as well as information from veterinary references regarding the use of medications as part of problem resolution. Our review of sample cases will help both dog owners and pet professionals think about these problems in a more critical and scientific way. Class notes are included in a PDF file for you to open and print.